Minnesota birder Bob White discovers another dead body. He gets entangled in the mysterious murder and helps police crack the case. But this time, the dead body is found in Birdchick's (Sharon Stiteler) car at a birding event. Did Birdchick commit the murder?! You'll have to read it to find out! I've enjoyed all the Bob White murder mystery books Jan Dunlap has written. Swift Justice is particularly engaging because some of the characters are based on real life people, real life conservation issues, and references to real life situations of birding interest, like the Wood Rail found in Texas recently, and even a Birds and Beers. How cool is that?! A couple years ago, I mentioned to Jan in an email that it would be really fun to find a way to incorporate a bird blogger into one of her books. She came through for me in Swift Justice with rival bird bloggers going head-to-head. Dunlap's writing style is delightful and her characters are endearing. I relate to her main character a lot, and I kind of have a crush on his wife, Luce. Dunlap leads the reader down many a rabbit hole and distracts you from the real murderer with red herrings and side plots that all tie together in the end. So many books end disappointingly with loose ends, but Jan Dunlap always ties up her ends nicely and the reader is satisfied with the conclusion...and justice has been served. 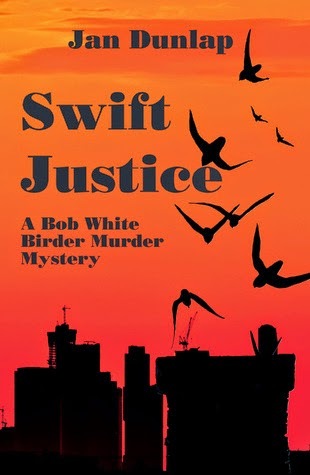 Swift Justice and the five other books in the Bob White murder mystery series are great reads for birders and for people who just like a good murder mystery. You can purchase the Kindle version for as little as $7.69. So worth it! Thanks for this intriguing review! Who knew? ?